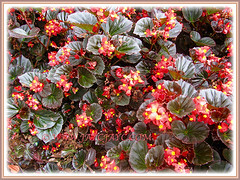 Various captivating begonias have graced our garden at the front yard ever since September 2004. 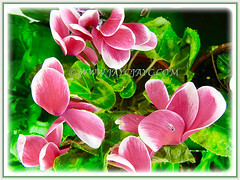 They are delightful and enchanting perennial flowering plants. It is such a joy to grow them and possess these beauties in our tropical Malaysia with everlasting summers. They are moderately easy to grow with the right condition. 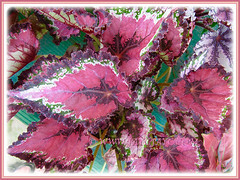 Begonia is a Ballarat Begonia Festival in Australia named after the flower. 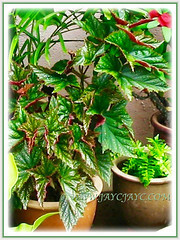 Botanical Name: Begonia, followed by its cultivar name. 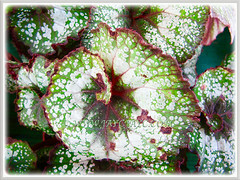 Common Names: Begonia, Angel-wing Begonia. 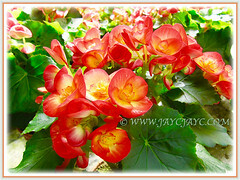 Etymology: The genus name Begonia is coined by Charles Plumier, a French patron of botany and honours Michel Begon, a former governor of the French colony of Haiti. Origin: Native to moist tropical and subtropical regions, as well as South and Central America, Africa and southern Asia. 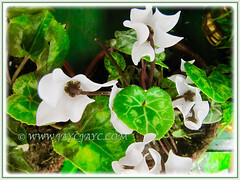 Plant type: An ornamental, perennial and flowering plant. 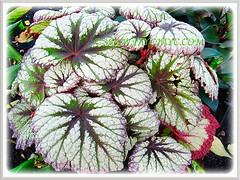 Features: Begonia is a genus of perennial flowering plants that consists of about 1,795 different plant species. 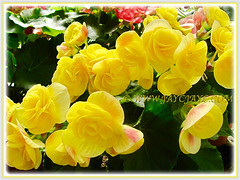 With such a large number of species, Begonia is the fifth largest angiosperm genus. Gardeners and horticulturists alike just love them and have created an enormous number of cultivars. 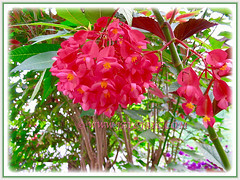 Members of the fibrous cane begonia group, angel-wings are upright growing plants with thick canes or stems, often brilliant foliage and heavy clusters of dangling flowers in cherry red, orange, salmon, pink and white. They can be easily identified by the folded, often feathery, winglike leaves that appear speckled, polka-dotted, banded or splotched in multicolours, including metallic silver. 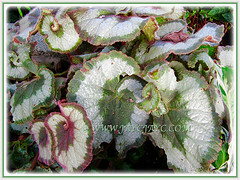 The fibrous Wax Begonias have leaf colours that may be chocolaty-red or have shades of green or bronze, and even some have variegated green leaves. 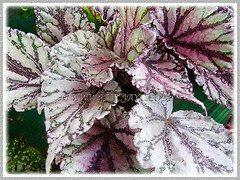 The splashiness of colour and pattern in the foliage often includes a contrasting color on the underside of the leaves. 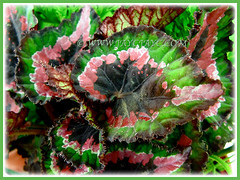 Deeply etched, lobed, with wavy or feathered margins, their foliage are truly unique. 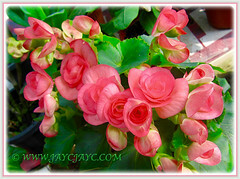 Some cultivars have double flowers that look similar to bubbly little rosebuds. 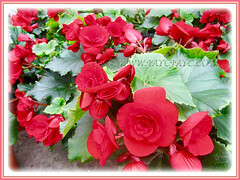 Begonias require bright light to intensify the leaf colourations and promote good flower development. 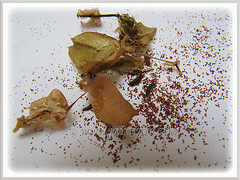 Begonia seed is a winged capsule containing numerous minute seeds. 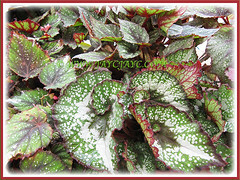 Culture (Care): Begonia can be grown easily with minimum to moderate maintenance. Light: Best in semi-shade or bright filtered light. Moisture: Moderate water needs. It prefers moist soil. Water regularly when in growth for optimum growth. Soil: Best in a mix of sandy, loamy and clayey soils as well as well-drained soil. Others: No pruning is needed. However, you can do tip pinching earlier to encourage branching. Provide good air circulation by removing dead leaves as soon as possible. Feed it once monthly with a balanced liquid fertiliser for foliage plants. Generally free from serious garden pests and diseases. However, do watch out for caterpillars, mealy bugs and thrips. May be subjected to powdery mildews, stem and rhizome rot. For subtropical and temperate regions: Hardiness: USDA Zone 10 to 12. 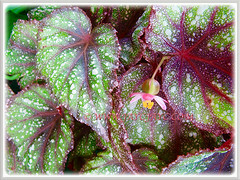 Begonias are mostly frost tender. Allow the soil surface to be almost dry between waterings by sticking a finger into the planting mix to check. Feed and water sparingly during fall and winter. Plants love to be slightly pot-bound. However, when the plant is one year old, prune it drastically down to 15 cm, both in the winter and again in late spring to encourage it to be compact, rounded and bushier, suitable for hanging baskets. Best to repot them during them in spring or summer. 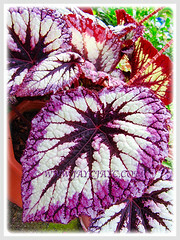 Begonias require bright light to intensify the leaf colourations and promote good flower flower development, though not full sun to avoid leaf scorch. Propagation: Best to propagate by sowing seeds. May also be propagated by rooting the rhizome cutting. Usage: It has many uses. Most ideal for container planting in pots and hanging baskets or grown in the ground in garden beds. Also, excellent for small spaces such as on the balcony or roof-top garden. 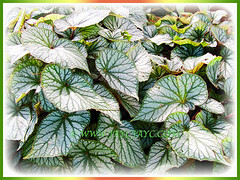 An extremely attractive plant with endless foliage variegation, that is a joy to possess.